We last heard about Meetrip, an online travel marketplace for Asia, when it expanded into 10 new cities last month, and now the company that offers unique travel experiences has jumped onto mobile with the release of 12 country guide apps for Android devices. Duckdive, the Japanese firm behind the service, has released apps for Singapore, South Korea, Malaysia, Indonesia, Philippines, Thailand, Vietnam, Taiwan, and Japan, giving owners of Android phones — which, it must be pointed out, dominate the smartphone scene across Asia — easy access to content from Meetrip users. Meetrip is a great way to locate novel and unique cultural experiences in cities across Asia. Hosts post activities that they can offer in a city — such as my test activity, a Bangkok food tour — in exchange for a (usually) small fee. Travelers to a city can peruse Meetrip to find the kind of unique things that they want to do, many offer real local and cultural insight that you just can’t find in guide books or hotel lobbies. What’s really interesting about this news is that Duckdive says that the Android apps are its “test case” for further expansion, which will see the service roll out guides for more than 1,000 cities. That’s quite an increase, and would give the site real spread, though it remains to be seen how easy getting enough content for those cities would be. Initially, I thought that a single Android app would make more sense for the service but, talking to Duckdive CEO and co-founder Takashi Kiyama, I can fully understand the approach that the company is taking. Yes, we decided to divide it for each city because a traveler has specific needs about the destination to visit. 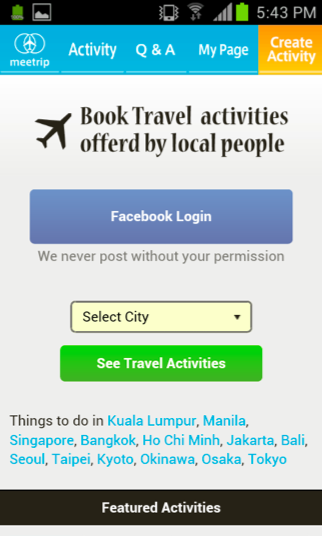 It’s kind of the same as Lonely Planet and other travel service has each city app and we will enrich the contents for each city for the future. 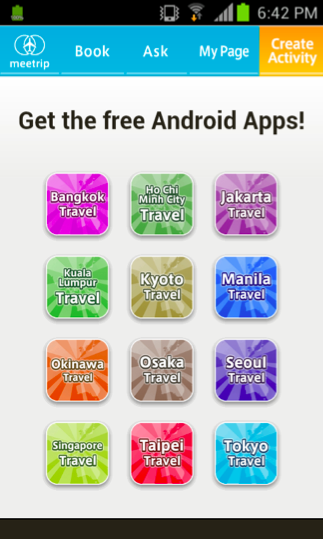 The purpose of the 12 Android apps release is to reach travelers. Many users access to Google Play and search by “destination + something”, e.g. “Taipei travel”. The IT literacy of such users is high, and they have strong needs to experience local culture at the travel destination. Therefore their profile matches with that of our target users’. Plus, because Meetrip is peer-to-peer marketplace, we need to increase the number of sellers (local guides) and buyers (travelers) at the same time. The expansion of 10 cities in November was aimed at increasing the number of sellers. On the other hand, the 12 Android apps is to increase the number of buyers. So, there you have it folks. If you’re taking a trip across Asia and want to get access to local experiences right from your Android phone, these 12 cities guides will be worth checking out. That’s in addition to the main website, of course. An iPhone app is also on the horizon, we understand; it will be interesting to watch this ambitious service grow across further geographies, and new platforms. You can grab the guides at the link below, screenshots follow.